Iona is an iconic and hugely popular tourist destination that is situated in the Inner Hebrides, south of the Isle of Mull. Iona is essentially, an ‘island off an island’ and is accessed from the mainland by a 45 minute ferry journey, followed by an hour long drive then a final short ferry crossing. The Iona Housing Partnership (IHP), a sub-committee of Iona Community Council (ICC), was formed in 2003 following the growing demand for secure, permanent, good quality accommodation for residents on the Isle of Iona. A generation gap on the island followed by a growth in population proves that there has never been a better time for new housing to be built. 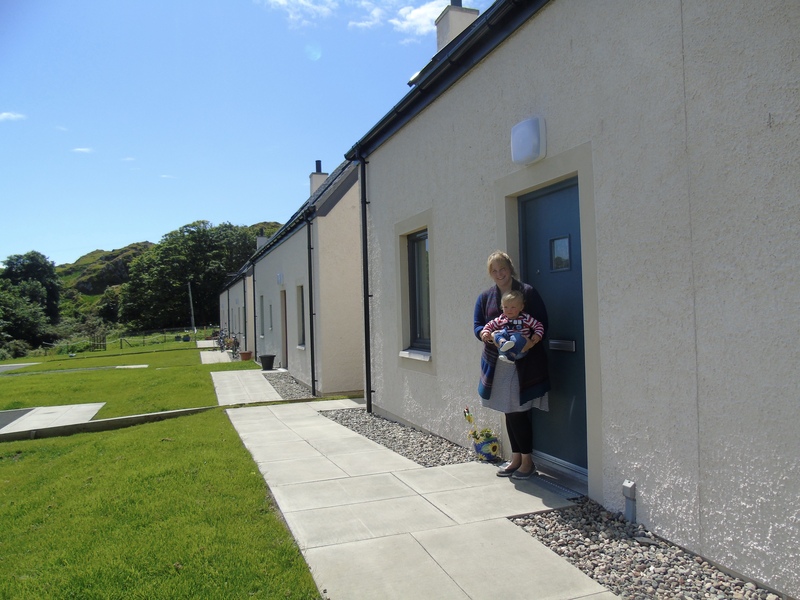 After a long and successful fundraising programme and thanks to support from Argyll and Bute Council, IHP were able to buy the West Glebe Field from the General Trustees of the Church of Scotland in 2011 as the site for their housing projects. Roots Design Workshop, based on the Hebridean island of Tiree, were selected by IHP to design the 5 affordable units ; two three-bedroom houses and three two-bedroom houses. Over the last few years, IHP have been fundraising for the project by organising BBQs, ceilidhs and boat trips among other events for locals and visitors alike. They have raised around £60,000, a phenomenal amount, using this method and the ‘Buy-A-Virtual- Brick’ donation scheme. The project was given a massive boost towards the end of 2014 when it was awarded a substantial investment grant from the council, enabling the project to go ahead by West Highland Housing Association. BUILD BEGINS… and is complete! 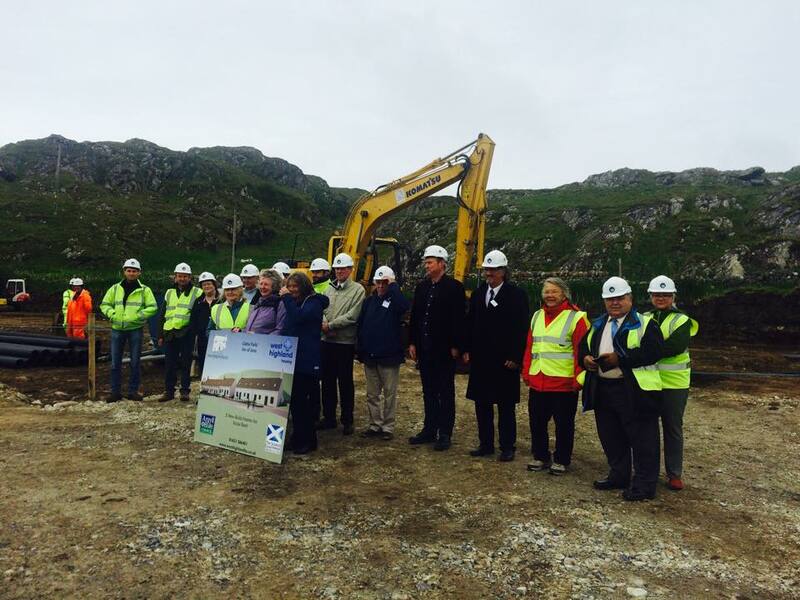 A well-attended ‘sod-cutting’ ceremony took place on Thursday 18 June 2015 to mark the start of the build. Councillor Robin Currie, Policy Lead for Strategic Housing, Gaelic, Community and Culture addresses addressed the gathering and Fiona Menzies spoke on behalf of IHP, expressing their thanks to everyone who has helped the project get to this stage. Lunch was provided by the Heritage Centre Cafe. 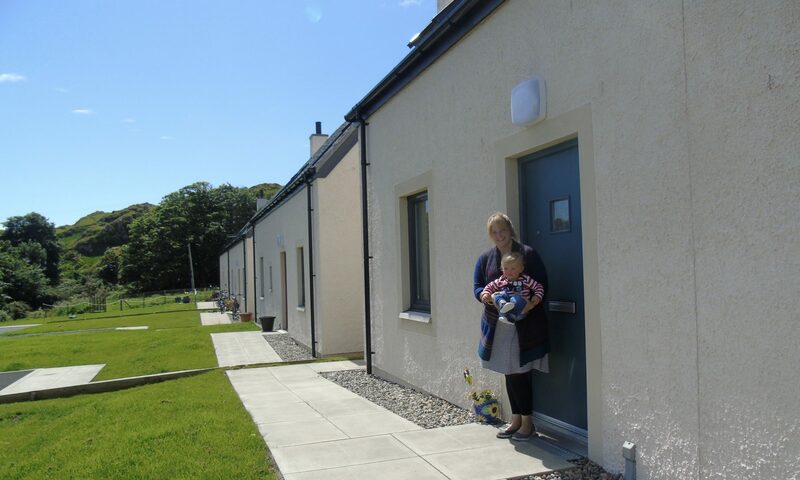 The houses were completed in Spring 2016 and new families are now enjoying their brand new homes. West Highland Housing Association will develop a Local Lettings Initiative to work in line with the HOME Argyll policy for allocating the properties on Iona. If you wish to be considered for a property, you should register on the HOME Argyll list. If you have already done this previously, it would be worthwhile checking that your details are up to date. More information will become available in due course with regard to the Local Lettings Initiative and other progress. The housing development was completed in Spring 2016. TSL Contractors undertook the building works. You can like the Iona Housing Partnership on Facebook and follow them on Twitter.